We are a reliable cleaning business providing top-notch services to clients in Charlotte. House cleaning and maintenance can be taxing for individuals juggling many responsibilities. It can be a struggle to keep a home clean! Hiring a cleaning business in the Charlotte, North Carolina area can relieve stress and help households focus on the activities that matter most. Quality cleaning services are a must when working with a cleaning business. 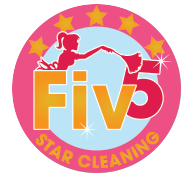 We work tirelessly at Fiv5 Star Cleaning to maintain consistently high-quality cleaning services. One of the ways we do this is to work closely with all of our maids. All of our employees are well-trained and held to the highest standards. We know each employee personally, and we never hire subcontractors. You can be confident that the maid working at your home in Charlotte is trustworthy, efficient, and experienced. Our services have been tried and tested by many clients in the Charlotte area. Our cleaning business comes to you with over seven years of experience. We clean over 130 customers’ homes each month. We would love to provide you with the premier cleaning services we offer. Contact us today to learn more about our house cleaning services. At Fiv5 Star Cleaning, our cleaning business proudly serves Charlotte, Concord, Cornelius, Gastonia, and Mooresville, North Carolina, as well as Rock Hill, South Carolina.